We used to take two publications when I was growing up: the Saturday Evening Post, and Life Magazine. Both went under in the 70’s. The reason was waste product, an advertising concept. The magazines had broad appeal – there was as likely something in any issue for me, my parents and older brothers. That created a problem. The makers of Geritol, for instance, did not want to pay to advertise to readership that did not use their product. It’s called segmentation. Advertisers insisted that magazines target audiences so that when they bought space, there was no waste. Hence, magazines like Gum Chewers Quarterly and Knot Tying Weekly Along with Cosmo and it’s endless ‘how to surprise him in bed’ lists and GQ for the self-imagined sophisticated male. Back in the 1980’s, AM radio was a wasteland, local stations barely surviving and even some talk that the bandwidth might have better uses. FM offered a more resonant signal and cornered the music market. The audiences were leaving AM in droves. Reagan saved AM by getting rid of the Fairness Doctrine and opening the door for right-wing agitprop radio. So AM survived as a business model. Now there is “left” agitprop – I used to listen to Thom Hartmann, and aside from his motor-mouthing and left-gatekeeping strategy, found the commercials to be too much. I would turn him off when they came on, and eventually came to a point where I simply left him off. This came to mind this morning as we are driving the west coast of Florida. I used the seek button on the radio looking for an interesting station and had the old AM experience: five or six stations in a row blasting advertising. FM has succumbed. So we drive in silence, which is very nice. We occasionally converse, nice for me and a bit trying for her, as you can imagine. Mostly, the passenger gets to read, write screeds and take in the scenery. Music entertains us, but from a marketing standpoint us only used to segment us. At one time, just like Life magazine, it had broad appeal, a few genres like rock, country, and whatever they like in the minority communities, hard to know for a white guy in Montana. This made it difficult for advertisers to reach their targets without waste product. So for the last half century we’v been segmented into various slices of country, rock, metal, hip hop, rap, salsa, easy listening, and blah blah. Classical music has no appeal to advertisers, and so is left to public radio. So if your particular taste is 80’s heavy metal, you’ll find an FM station that has your brand, and advertisers lined up to hit you with exactly what their research says you will purchase. There’s a meme out there that market “choices” yield consumer satisfaction. That’s nonsense. Advertising pesters us, annoys us, but most importantly, makes us unhappy. Why on earth would we want new products if we were satisfied with what he had? That’s not choice. It is manipulation to the point of exhaustion. The radio dial is now fully employed to advertiser needs, not consumer. Thank you advertising for one thing, however. Now, when we drive, we also appreciate quiet time. From citizen to consumer in a few short decades. As merger and acquisition (“M & A”) proliferates unabated, choices will go down as price goes up. Relax, there is “no inflation.” No constitutional rights, no public debate, and no chance of turning any of it around anytime soon. It’s a lock. There’s always quiet. It still has great appeal. As I recall Geritol sponsored Ted Mack. Do you remember or are you of much younger years? 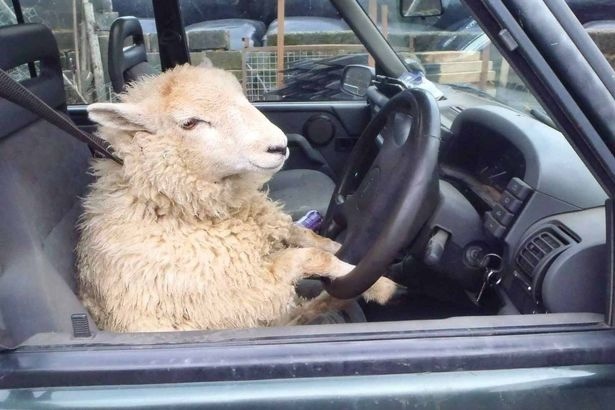 By the way what’s with a sheep in a right hand drive auto if you are in Florida???? More like Scotland.